Color changing and white LED reel tape light, RGBW with IR wireless remote control, dimming, 3000K, plug in, and damp location. 30,000 hours average life. Clear diffuser, white fixture. 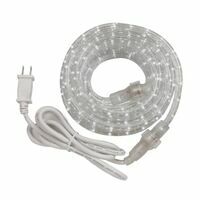 60" 2 prong polarized power cord, in-line on/off switch. ETL Listed. 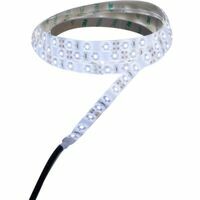 Indoor/outdoor LED rope light features flexible, transparent, heavy duty, UV inhibiting PVC tubing that resists yellowing and cracking. Connect additional kits for up to 300 feet of continuous light. Line steps, put on bottom or top of cabinets, valances, sliding doors, windows or entertainment center. Commonly used outdoors to outline decks, patios, pathways and stairs. Day white (6000K) light. 48 foot, 120 V, 50/60 Hz, 2 watts. ETL Listed.